Normalization of Chongshin University, surveys on heretical groups, and change of the election method. These are the core agenda for the 103rd General Assembly of the Presbyterian Church of Korea (PCK Hapdong; moderator: Rev. Jeon Gye-hyeon), to be held for five days and four nights from September 10, at Banyaweol Church (Rev. Lee Seung-hui) in Daegu. For three years in a row, the foremost issue at the PCK Hapdong general assembly has been the normalization of Chongshin University (president: Kim Yeong-wu). At the 101st assembly, the denomination found no clues to the solution, while various interest seekers were jousting over the formation of the school foundation board. The 102nd assembly the following year took place amidst a breathtaking mixture of sit-in rallies requesting resignation of the president, a fact-finding investigation by the Ministry of Education, the dismissal of all board members, and the selection of acting board members. PCK Hapdong seems determined to sort out the situation at this year’s assembly, with the receipt of more than 30 overtures related to Chongshin University, among the total 360 that have been submitted. These are diverse, ranging from protection of students who have been victimized by the prolonged situation at Chongshin University, and restoration of the original articles of association, to investigation and settlement related to President Kim Yeong-wu, the board members and related professors, as well as investigation and determination related to the employment of a private security team, and other matters. Considering that on August 31 the Prosecutor’s Office demanded 10 months in prison for President Kim on suspicion of breach of trust by soliciting bribes, and that the court is scheduled to hand down the sentence on October 5, the general assembly delegates are likely to make strong requests for appropriate punishment of the concerned persons. It is also striking that, different from other assemblies, the number of overtures requesting investigation of suspected heretical thought is nearly twice the number of those requesting theological interpretation. Twelve overtures this year ask for verification of the theological thinking of currently active pastors, missionaries, or publishers. There is a petition to ban participation in seminars or use of textbooks on the history of salvation by the founder of Pyeonggang First Church. Due to increased worries about potential vote-buying, since the last assembly decided on direct elections of board members, six presbyteries have submitted overtures asking for the adoption of the “Method of Matthias,” by which an overheated election campaign can be prevented when multiple candidates are competing. In this method, the two top candidates are selected by direct election and one last person is selected by drawing lots. 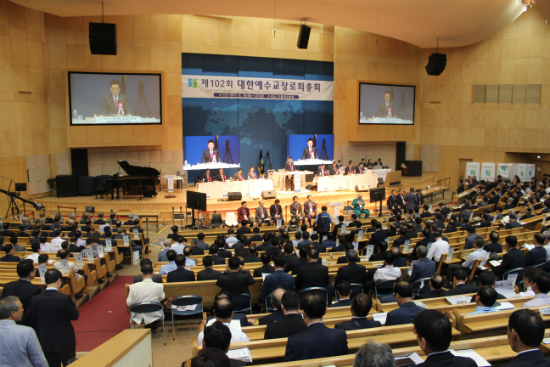 Some voices have noted the relative lack of overtures by this largest church denomination in the area of Korean church-and-society issues, such as the clergy tax, opposition to homosexuality and the anti-discrimination act, and opposition to alternative military service, for which only one overture each has been submitted. Most PCK Hapdong overtures this year are focused on solving the structural problems that the denomination currently faces. *Photo taken in September last year at the PCK Hapdong 102nd General Assembly, held at Gibbeumui Church in Iksan, North Jeolla-do.